TemplateToaster WordPress Theme Framework is a free, scalable, and completely SEO-friendly theme framework that empowers you to build flawless WordPress websites in no time. It has everything that any novice or an expert developer would need to create an incredible website with ease. It’s designed in such a way that it accelerates the entire process of designing a WordPress theme with minimal efforts. 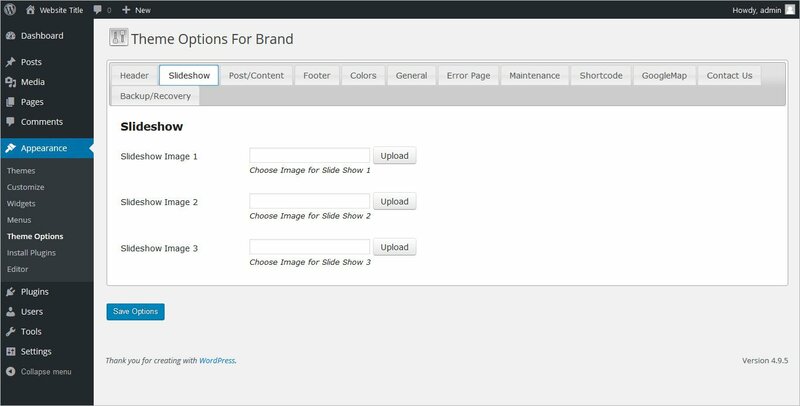 What makes its WordPress Theme Framework unique is its ability to deliver perfection, beyond your imagination. This theme framework gives you beautiful responsive themes. You can create an amazing site with top-notch features, faster with no coding. With this WordPress theme framework even after you have exported your theme you can still customize your site’s Logo, Social Media Icons, and Website Slogan as per your requirements. 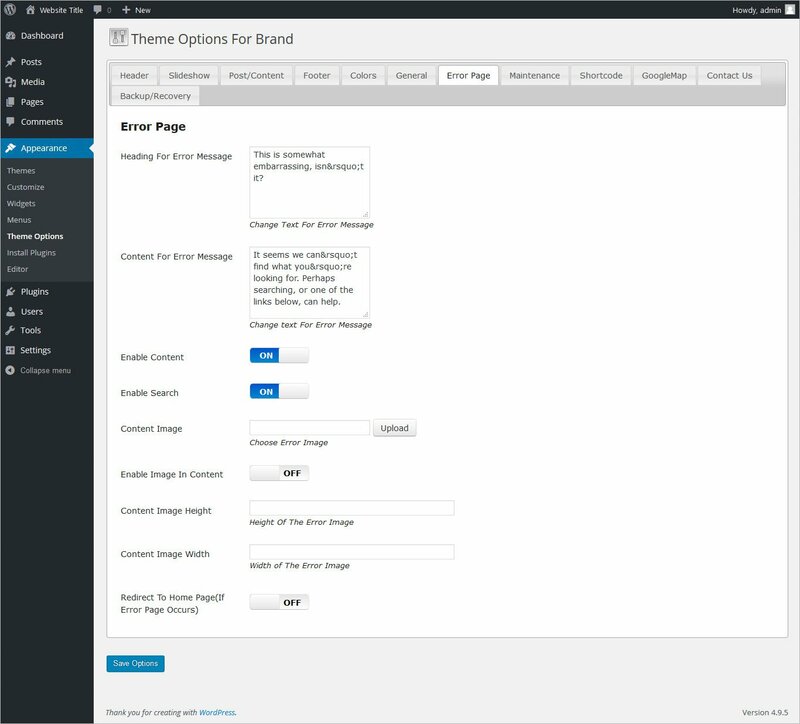 Its WordPress theme framework lets you replace the slideshow images, even after installing the WordPress theme. Be as creative as you want and make a beautiful slideshow with ease. 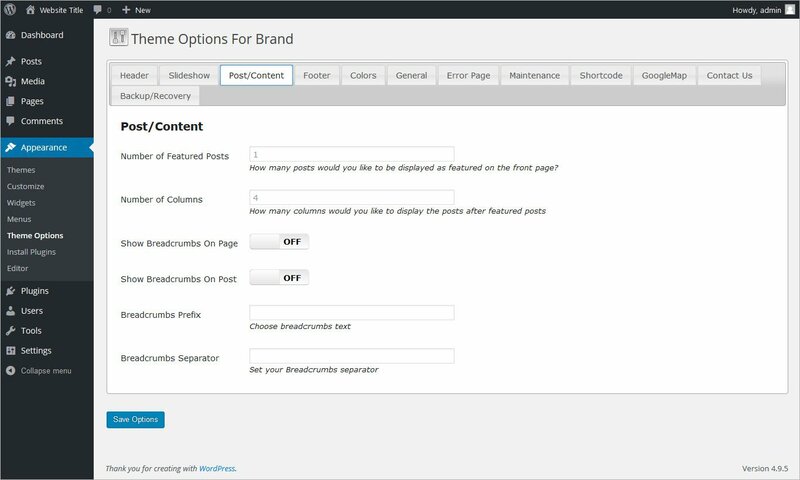 This WordPress Theme Framework allows you to decide on how many posts, in how many columns along with breadcrumb navigation, you want to show on your homepage. 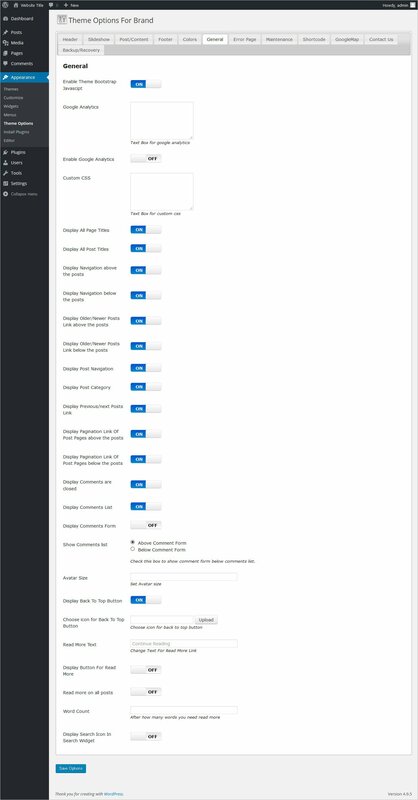 The footer option here will allow you to conveniently style your WordPress site footer. You can edit/add or show/hide Copyright Text and URL. And you can customize Social Icons as well. 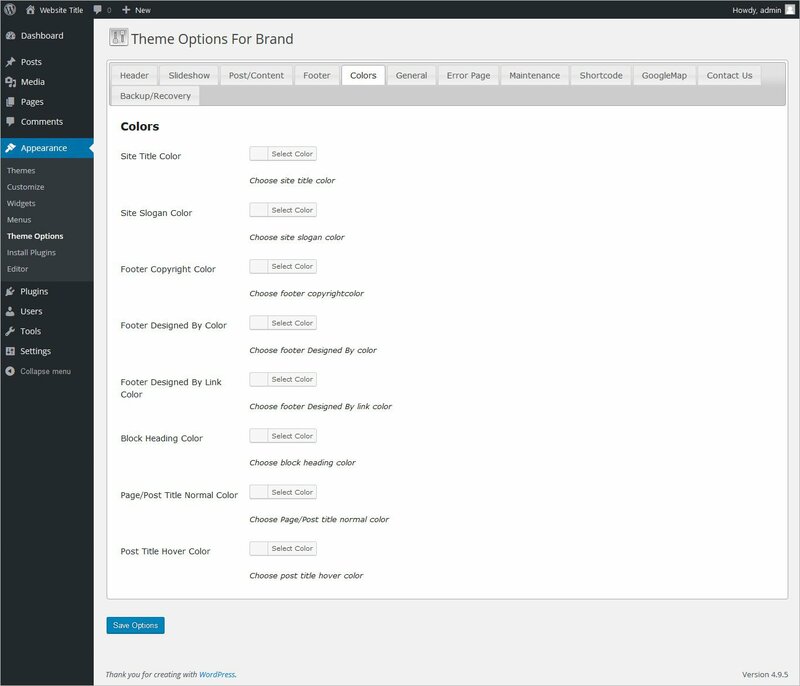 Give your WordPress website your choice of color combination. You can anytime change the color scheme for your Site Title, Slogan, Copyright, Footer, Post Title, Title Hover. The general option of your website can be managed here. You can enable or disable elements like Page Title, Google Analytics, Next/Previous Link, Post Title, Navigation, Avatar, Comments, etc. 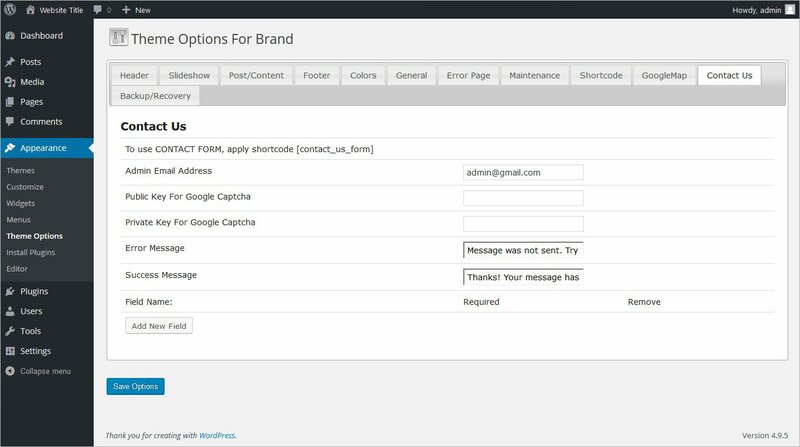 We don’t want any error to occur but if by chance any error arises due to misconfiguration then you can manage what message you want to display to your visitors. You can show an error message and image, redirect to the home page, etc. Means you can completely configure your 404 pages. 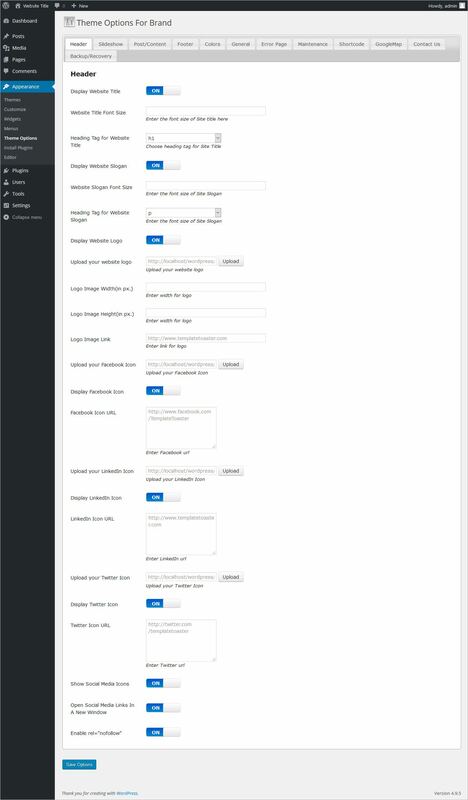 This is an interesting feature of this WordPress theme framework. 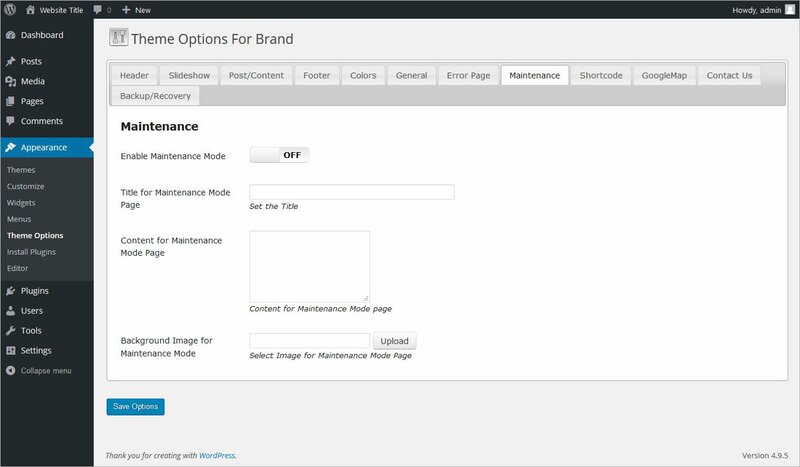 It lets you display information about your site is being maintained with the help of page Title, Content, and Background Image. If you ever put your site under maintenance you can simply use this option. 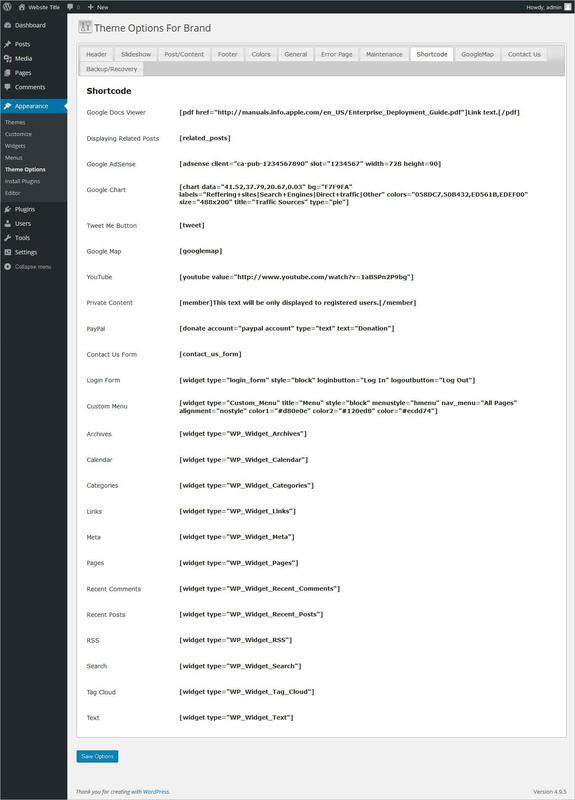 This WordPress Theme Framework is loaded with shortcodes. You can get anything from Google Map to Google Doc Viewer, Google Adsense, Google Chart, PayPal, Calendar, RSS, Search, & a lot more. 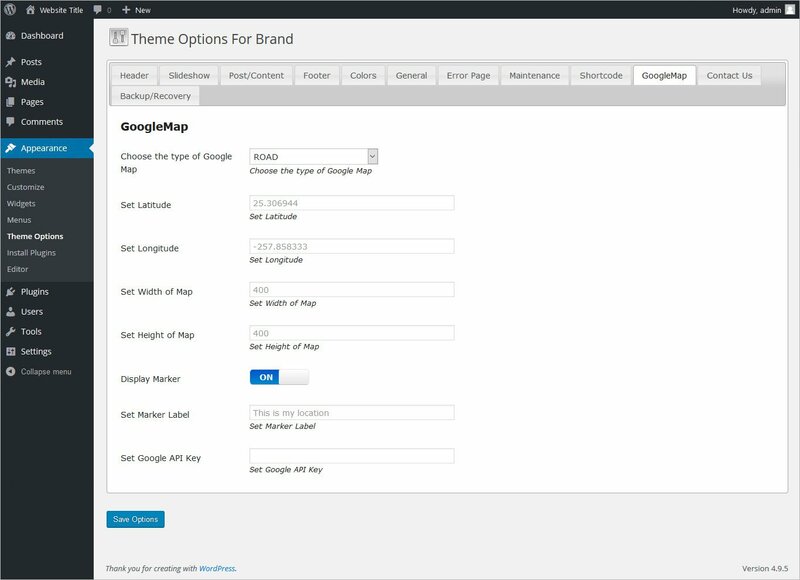 You can freely show Google Map on your site using our WordPress theme framework. Set the Latitude, Longitude, Width, and Height of Map. Furthermore, set the display marker on/off. 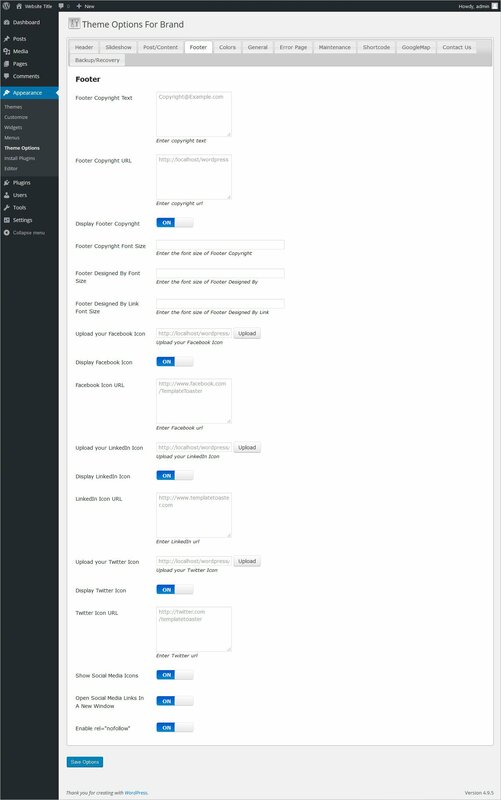 You can anytime create and design the Contact Us form. It’s up to you if you wish to specify Google Captcha Public or Private. It lets you add more field in the form like Error/Success message, etc. It comes with Backup & Recovery feature. An important one indeed. 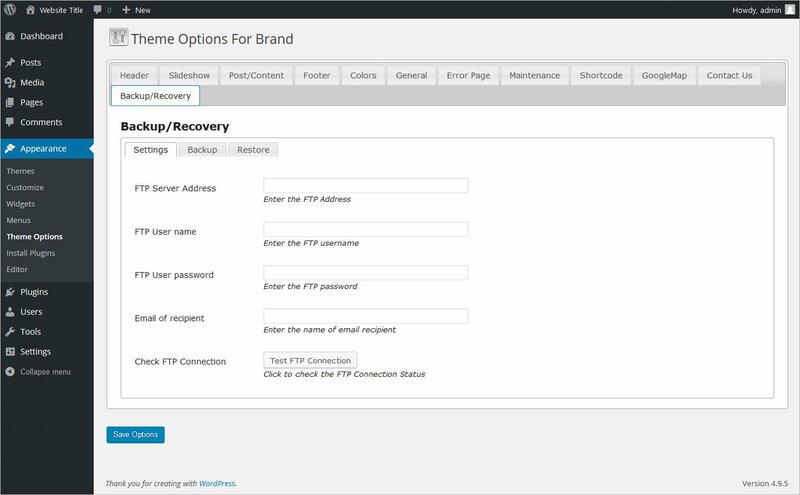 Simply give your FTP info & Email address for backup storage and an automatic backup schedule will be built.